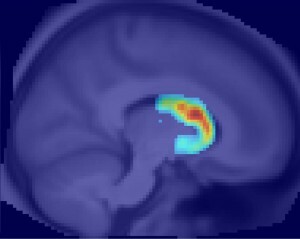 A composite brain scan image showing the brains of experiment participants reacting strongly with dopamine to the old, once-rewarded stimuli . People in the study still found the shapes they were looking for, they were just slower doing it. The previously rewarded “red,” distracted them. When Yantis died, Courtney and students in the Yantis lab felt strongly that his work had to continue. Courtney, who Yantis recruited to Johns Hopkins, took on his research program and “adopted” his students into her lab. In the last year, their combined teams have worked to finish Yantis’ final projects and launch new ones that combine his ideas with Courtney’s. This paper’s lead author, Brian Anderson, was a graduate student in the Yantis lab and now works for Courtney as a postdoctoral researcher. This work was supported by National Institutes of Health grants R01-DA013165, F31-DA033754, S10-RR023623 and S10-RR017219.